Great news for all you Northern beauty fanatics: Models Own have brought one of their iconic Bottleshops to Meadowhall Sheffield! I was invited down to meet Emma (head of retail for Models Own) and have a little look around their shop. Situated on the lower High Street right near Victoria's Secret, the Models Own Bottleshop is hard to miss. It was designed by Mark Rodol who is the CEO of Models Own (former CEO of the Ministry of Sound) and has taken the love of nail polish to the extreme with a shop made to look like a bottle of nail polish which has been knocked onto its side with pink 'polish' running out of the top. A really clever, eye catching way to expose Models Own to the maximum, don't you think? How could you possibly walk past that without having a look inside? Models Own began online and in high street stores such as Boots & Superdrug but they now have Bottle Shops showcasing their collection of products in 5 different UK locations (with another one opening in Leeds White Rose) and they have also gone international in places like Tokyo and Taiwan (full list of Models Own Stockists here). As if their plethora of shades, glitters, brushes and nail art tools aren't enough, all Models Own products are made in the UK and they are tested on humans not animals which makes me love what they do just that little bit more! 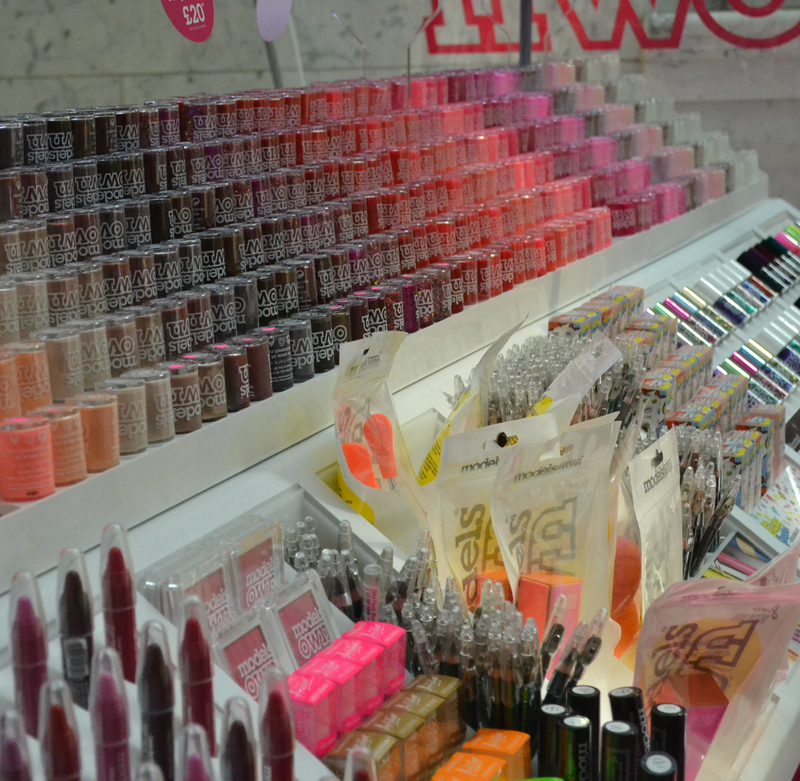 In the Bottleshop you should find 14 of their nail polish collections plus individual shades, as well as their nail art supplies, makeup brushes, lip products, eye products and so much more! I genuinely don't know how they manage to fit it all into one giant bottle of nail polish and make it look so neat and tidy! All in perfect shade order, I would say it's easy to choose the ones you want but it's really not; I could easily spend a small fortune on Models Own polishes. 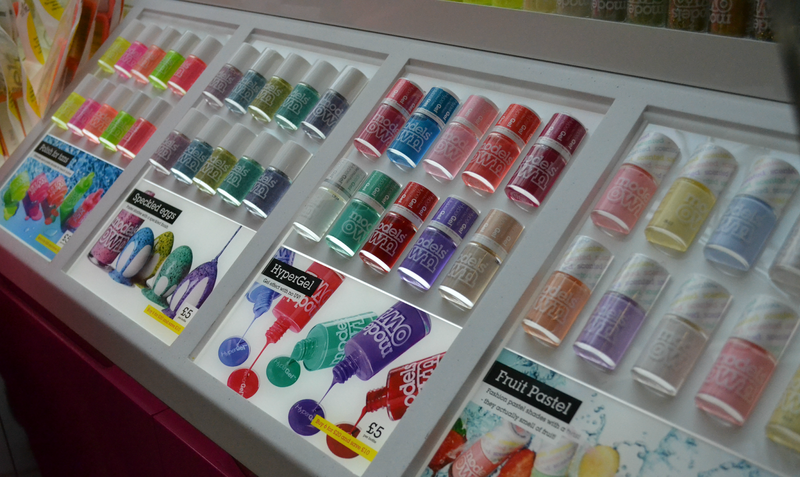 There's something for everyone in the Bottleshop, from their core collection of shades to their sparkly Hed Kandi and Mirrorball collections... then of course there's their newest collections; HyperGel and Polish for Tans. HyperGel is their brand new gel-like formula which doesn't require UV curing and can be removed with regular nail polish remover, but is still high shine and long lasting... the HyperGel top is fast becoming a hero product as it can be used with any brand of polish to create a quick drying, high shine finish. The Polish for Tans collection uses the perfect mix of neon and pastel to create shades which highlight bronzed skin; perfect for summer fingers and toes. Don't forget to have a look at the Models Own girls' nails, they're all perfectly polished with their favourite Models Own polishes! It took me quite a while to choose what I wanted but I finally came away with 12 polishes; the individual polishes are £5 each but they have an offer on at the moment where you can buy 6 polishes for £20... why would you buy one for £5 when you could just buy 6 for £20? You'd have to be one restrained lady if you can walk out of the bottle shop with just the one polish! Also, if you go into the Models Own Bottleshop and should 'I Love Models Own' there's a free gift in it for you (while stocks last)! Please let me, Meadowhall and Models Own know what you think if you're visiting by tagging us in on Twitter and Facebook and using the #bottleshop hashtag. The Meadowhall Bottleshop has broken Models Own records with how popular it's been so you'd be daft not to come and see what the fuss is all about! Keep your eyes peeled for my Models Own Bottleshop haul, there's 12 bottles of gorgeous nail polish goodness for me to play with over the next couple of days, and I can't wait to get started!! Will you be visiting Meadowhall to see the Models Own Bottleshop? I think I just died and went to beauty blogging heaven. That looks amazing! !